In the Thierry Mugler universe there used to be two superheroes who defended us perfume-loving civilians against the banality and lack of quality & creativity within the perfume industry. These superheroes were; A*men, whose superpower was the ability to shock and stun any villain with his audacious blend of lavender, mint, cocoa, coffee, patchouli & tar and B*Men, whose superpower was the ability to leave villains in awe of his intriguing, addictive odour. Unfortunately one of these superheroes was defeated by his arch enemy ‘General Perfume-Consumer’, who knew that the hero’s kryptonite was to ignore him, and with that knowledge the evil villain made it their mission to destroy our beloved hero. So, here we are today, lamenting a long lost comic book hero who was my favourite fragrant superman – B*Men. 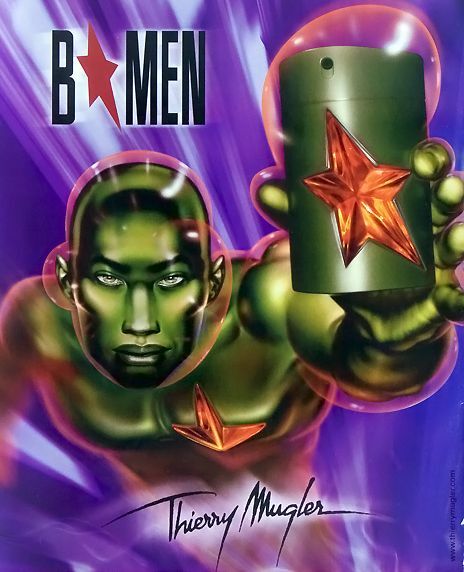 B*Men was released in 2004 and followed A*Men (or Angel Men as it sometimes known) as the second superhero themed masculine fragrance from the world-renowned couturier, and un-confirmed extra terrestrial – Thierry Mugler. Whilst it wasn’t presented as a flanker to A*Men, B*Men does showcase Mugler’s gourmand signature and can be seen as a lighter, less extreme version which would appeal to those who like their fragrances slightly less ‘over the top’. 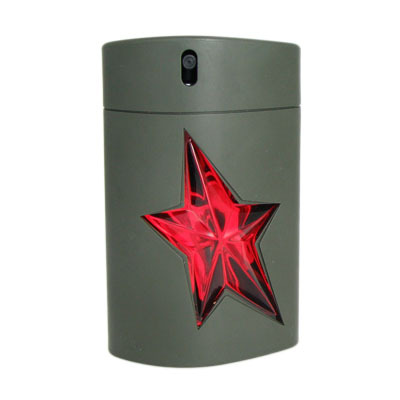 Mugler’s first masculine, A*Men (1996), is what I would call an ‘everything but the kitchen sink’ fragrance, it seems to contain just about everything you can imagine chucking in a fragrance; lavender, mint, coffee, chocolate, caramel, patchouli and tar. The genius behind A*Men is that this ‘concoction’ really shouldn’t work, but somehow it does, the downside is that A*Men is a polarising fragrance, some love it and some hate it. With B*Men Mugler seemed to create something that would be slightly more user-friendly, less polarising and with wider appeal. B*Men feels like the antithesis of A*Men, it is simpler, more refined and definitely higher up on the wearability scale. It starts rich and warm with tart rhubarb and coffee beans, the sweetness of the rhubarb and the bitterness of the coffee offer an interesting contrast. The top notes also have a green spikiness to them, that at first seems a little unsettling, but it gives the rhubarb a more natural, earth quality, which is complimented by the addition of vetiver. Where A*Men showcases a stonking great big dark chocolate note in its heart, B*Men opts for the lighter note of praline, which also showcases a cocoa facet, but adds a delicious nutty vibe thanks to the praline’s main ingredient of hazelnut. There is also a dry, spicy wood note that runs throughout B*Men, which adds weight to the composition and amps up its overall spiciness. B*Men isn’t unusual in the same way that A*Men is (which is just so outrageous there could never be anything like it), it’s definitely more masculine for a start, but it is still very unique, albeit in a more quiet and subdued way. It has a slight soapiness to it which makes me think of classic masculine colognes and feels completely out of place with the warm, spicy notes, but somehow it all gels together wonderfully. After a good few hours B*Men becomes a spicy, woody vanilla that lasts and lasts and lasts (you get the idea). I wouldn’t say that B*Men is a linear fragrance, but it doesn’t go very far in its evolution, what you have at the end is a lighter, slightly less tart version of what you had at the beginning, but I’m not complaining, I like what I had at the beginning. Many other blogs have mused about why B*Men wasn’t a success and one big factor that always seems to be mentioned is the name and concept behind the fragrance. When you start with A, B seems almost second rate, as if it’s not quite as good as A. Why Mugler didn’t choose to call it D*Men (as many have suggested) will always be a mystery to me, D*Men would have been perfect (let’s face it not even Mugler would go with C*Men, that’s best left to our buddies over at Etat Libre d’Orange), he could have played with the concept of Devil and Angel, A*men being the good guy and D*Men being the bad guy. It would have been awesome, D*Men would never have been seen as a second-rate A*Men and all would be right with the world. I don’t think the name and concept were the main reasons why B*Men wasn’t a huge success, perhaps the general perfume-buying public didn’t see much of a difference between the two and because A*Men is more unique and is also the male counterpart to Mugler’s hugely successful flagship fragrance Angel, they didn’t feel that B*Men was entirely necessary. B*Men can still be found in a variety of sizes on eBay for fairly decent prices, it no longer seems to be available via online discounters. Try to get the 100ml refillable metal flask if you can. If you’re looking for something similar to B*Men then Jean Paul Gaultier’s Kokorico would be worth a try, it’s an even cosier and woodier version that I would recommend to any B*Men lover. This review is based on a bottle of B*Men from my own personal collection. Posted in Gone But Not Forgotten, Gourmand, Masculine, Perfume Reviews, Thierry Mugler, Woody and tagged B*Men, But Not Forgotten Series, Gone, Gourmand, Masculine, Thierry Mugler, Woody. Bookmark the permalink. It’s a massive shame, B*Men was a very well made, and IMHO quite a commercial scent, but it wasn’t outrageous and perhaps that’s what most Mugler fans are looking for. I loved this one so much… I have seen it on ebay but I haven’t got round to actually buying it. Priorities, priorities…. I have to do it soon though because I am afraid it will soon disappear from there too. I do not think Kokorico reminds me of it though. It is a lot more high pitched and a lot less gourmand…. I have Kokorico but I still need my BMen! You do need your B*Men, it’s reassuring that it can be found for reasonable prices on eBay still. There is definitely an element of B*Men within Kokorico, but I agree that it is woodier and less gourmand than B*Men. There certainly would be room for both in my wardrobe. You have made me desperate to try BMen! AMen is really too much for me (SO sweet, sugar and tar should never mix IMO). You know, it is really interesting to see how the Thierry Mugler line has done such a good job maintaining the creator’s vision even though Mr. Mugler is no longer there. I think that A*Men is even a little too much for me (shock, horror)… I wear it very rarely. As far as I know, Thierry Mugler still signs off all of the fragrances @ Mugler, but I could be wrong. I am a huge sucker for scents with rhubarb, and always prick up my ears at the mention of a scent being wearable – would you say it was wearable by a woman? Re A*Men, those notes remind me of Armani Attitude, but with more f&fs chucked in – do you detect any resemblance if you are familiar with that one? I would say that it could be wearable for a woman, it might have a bit too much oomph for you though. A*Men and Attitude are VERY different, but there is a tiny similarity between both of their coffee notes. I have quite a lot of both A*Men and B*Men and would be more than happy to send you some if you’d like to try them? Didn’t think much of this “back in the day” when A*Men was as close to a signature scent as I had. I’m intrigued to find out my reaction to it now though given my 180 on A*Men; I may love it. Seeing as you’ve done a complete 180 on A*Men the chances are that you would enjoy B*Men, it’s something that I would imagine you liking. After reading countless reviews, I still can’t get a grasp on what B*Men might smell like, but your review is by far the most detailed, so thanks for posting! I’ve read everything from burnt toast to rhubarb crumble to sawdust to hot glue gun, all of which makes me itch to smell the stuff. If it’s anything like a gentler, less obnoxious A*Men, I’m sure I’ll be able to appreciate it; A*Men is just too much for me, a nice concept with the proportions all out of whack and the volume dialed to 11. Hi Darryl! Thanks for stopping by. I’m glad that you liked the review. I agree that B*Men is very much a toned down A*Men (which is even too much for me sometimes) and as far as blind buys go, it’s pretty safe, and with your gift card it’s even safer. Thanks for the info re B*Men online and in Canada, you are lucky to still see it, it has completely disappeared from the shelves over here, eBay and a few online discounters are the only options. It was available in Wilkinson’s until a couple of years ago for a tenner! Typical! That is typical. I occasionally see it at TK Maxx but it seems to be getting rarer. I tried Kokorico in the shops recently. Didn’t quite like it at the spot. Got home and it was making me think twice. So,would you go for B*Men or Kokorico? What about Paco Rabanne’s $1M or the joop? Hmmm, good question! I think I’d choose B*Men over Kokorico, it has a spiky quality to it that I find more appealing. 1 Million is a nice enough fragrance but I think there are better examples of the fruity-amber style out there. The Joop is a big synthetic mess to my nose. I have three bottles of B*Men (I wonder, why didn’t they follow this with C*Men?) I liked it back in 2004, now I find it too spicy. Anyone want to swap?